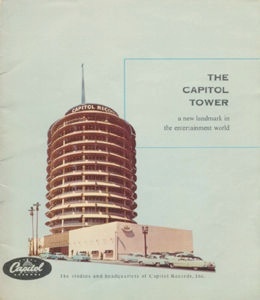 For those who don’t get to Hollywood very often, a quick geography lesson: To get from Capitol Records (“A” below) to the Reprise headquarters and United Recording (“B” below), one only had to travel about 3 blocks south to Sunset and hang a left, passing the world-famous Hollywood Palladium (grand opening act: Dorsey/Sinatra, 1940) and Columbia Square (where Sinatra often recorded for Columbia Records) on the left side of Sunset Boulevard, with Gower Gulch (where I’ve had many a 2 AM meal at Denny’s) just past that on the right. 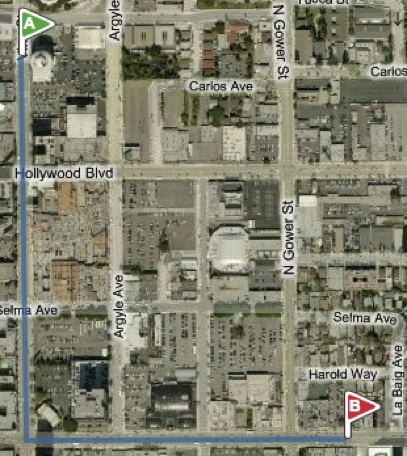 It’s very easy walking distance between the two studios. 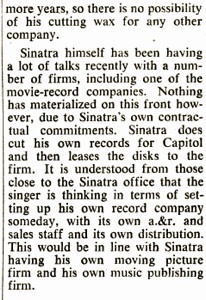 Even though Capitol and United were close in terms of geography, they were worlds apart in terms of approach, and when it came to label management, Mr. Sinatra was truly The Boss at Reprise. 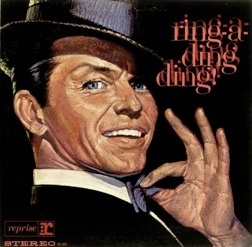 It was his company, top to bottom, and it likely felt a little odd to him at that first session for Ring-a-Ding Ding to realize that all the layers of management that were at play at Capitol were now literally “below him” at Reprise. 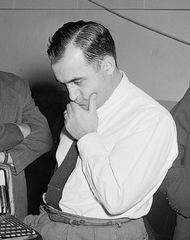 One of the first shots Frank called was to bring recording/engineering guru Milton “Bill” Putnam on board. Or was it? 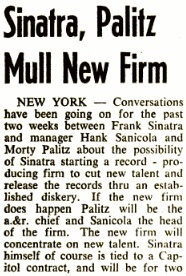 According to Chuck Granata’s excellent Sessions with Sinatra, former Decca Records man Morty Palitz was to be brought to Reprise “to direct its recording division,” whatever that means. 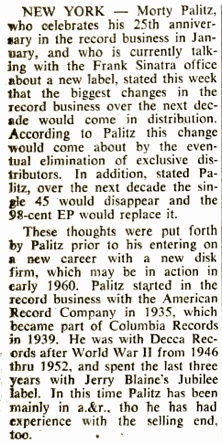 Based on Palitz’s experience at Decca, Columbia, Jubilee, and other labels, it would seem that he was to be Reprise’s head of “A&R,” meaning that he would be a liaison and talent scout of sorts, and would likely wear a producer’s hat with some frequency, whilst pairing talent with song. 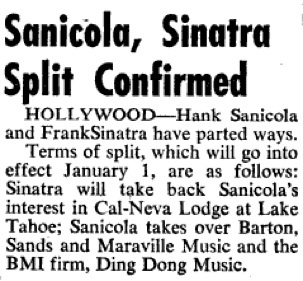 Palitz, a Sinatra friend since the Harry James days, and somebody who counted Milt Gabler, Sonny Burke, and Gordon Jenkins among his professional associates, clearly had a good ear for both talent and sound quality, having worked at Decca’s wonderful-sounding Pythian Temple, then getting Columbia’s pop orchestras out of their acoustically dead corporate spaces into the warm, naturally reverberant Liederkranz Hall. (Click both photos at left for more info.) 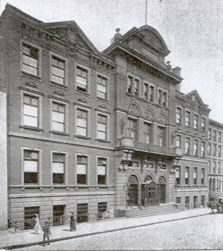 Liederkranz was previously used by Victor Records in the early days of electrical recording, starting in 1927, but Victor vacated the property in 1931. 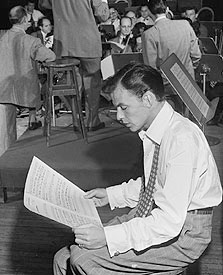 Many of Mr. Sinatra’s large-group Columbia recordings were made in the third floor auditorium of Liederkranz during the 1940s (photo at left). you died.” And that’s how Morty Palitz wound up missing the Reprise Riverboat....maybe. 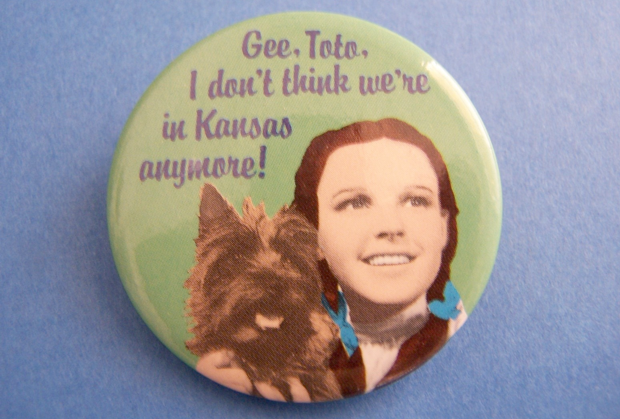 Billboard Magazine suggests otherwise, though. 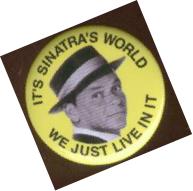 First-ever sessions for what would become a Reprise release. 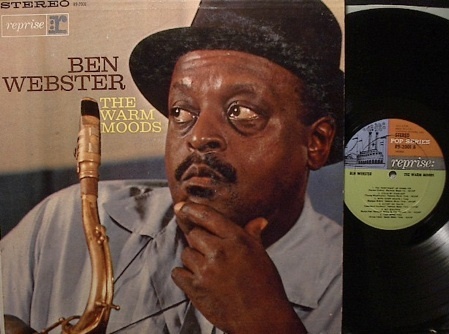 Sessions take place at Radio Recorders on Santa Monica Blvd. (a few blocks SW of Capitol and United), nicely engineered by Dave Wiechman. 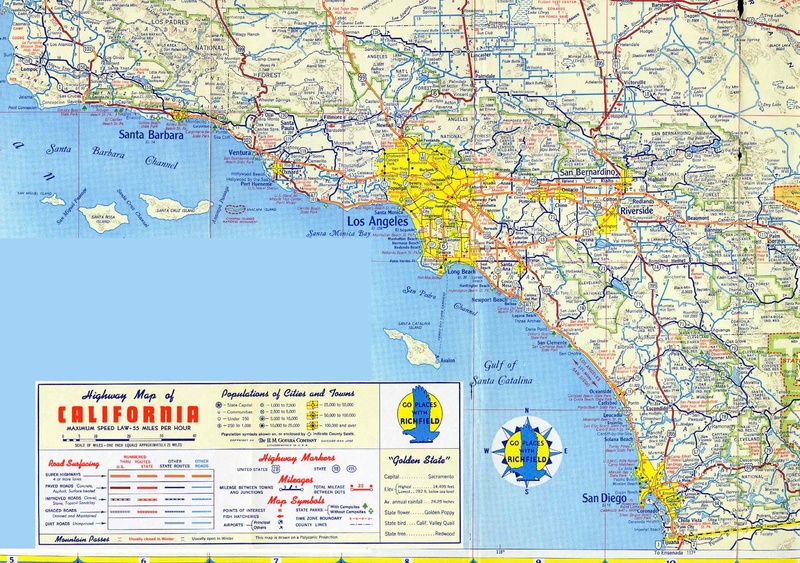 Palitz’s influence? 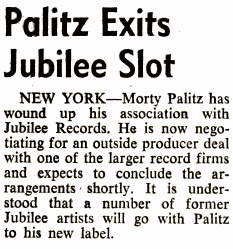 Record executive Morty Palitz dead of heart attack at age 53.